Before I explain our reasoning behind the no Santa thing, I want to say that I know every family is different. There are many reasons for doing or not doing Santa. I know many great, Christian families that do Santa and still manage to keep an emphasis on Jesus. Keith and I both grew up in homes that did Santa, and we're relatively unscarred. A few years ago, if we had encountered someone who claimed not to do Santa at Christmas, we would have thought they were off their rockers, so I do realize this may sound completely crazy to some readers out there. End disclaimer. There are several things that have shaped our views on the whole Santa/gifts thing. The first comes from our experience in Ethiopia. Keith and I learned so much in our five weeks there. We fell in love with the people and the culture, the simplicity of life and the absence of commercialization. While there are benefits for Gus and Lula here in the US : family, health, education, etc., I do feel that they're missing out on certain aspects of life in Ethiopia. Especially the uncluttered, simple way of life. While we obviously had many concerns while we were there about the adoption process and Lula's health and when we would be able to come home, we had an incredibly care-free experience overall. There weren't possessions weighing us down. Life was easy and simple and neat. I know that it will be a huge struggle to share that experience with Gus and Lula as they grow, given the culture in which we live. We are so bombarded with promises of things that will make us feel happy and good, when there is just One who can do that. Choosing not to do Santa is just a small step in the direction of simplifying our lives of things and orienting them toward living out God's plan for us. Which brings me to our second reason for nixing Santa : theology. I am not a great theologian. Keith is much better-read than I, but I do know that Christmas (and all our lives for that matter) is supposed to be about Jesus - looking back on his humble, yet earth-changing birth, and looking forward to his glorious return. The chief end of man, as the Westminster Catechism states, is to glorify God and enjoy Him forever. This is what I want my kids to grow up believing that Christmas -- and every other day of the year -- is about. 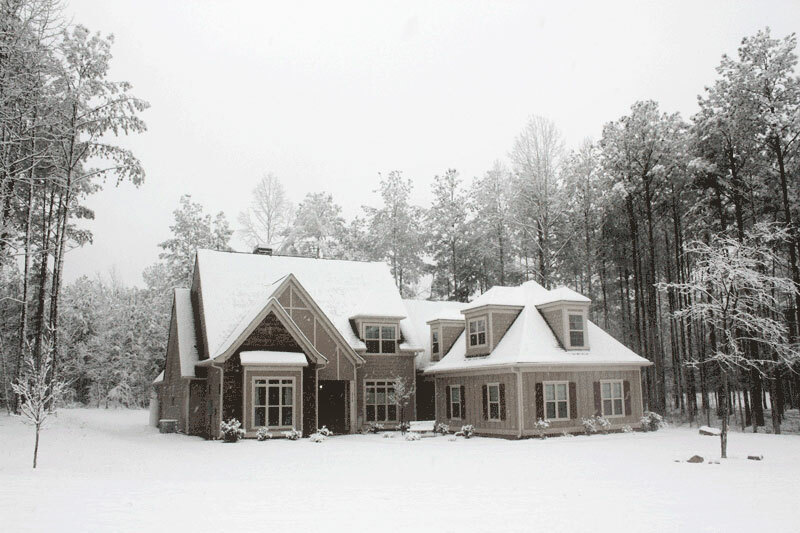 Random photo of our house last Christmas (on the first White Christmas in Atlanta since 1882!) because I feel bad that there are so many words and so few photos in this post. *For one, Santa brings things. Toys and books and candy. Things that our society would like us to believe will make us happy, but will eventually leave us feeling empty. God gives us the gift of His Son. The perfect, free gift that will, in turn, give us eternal life, love, joy and communion with God. The gift that we will have forever. Little bit different than a new baby doll. *Santa brings you gifts only if you've been good enough. Kids live on edge this time of year, hoping they'll be good enough to get that toy they've been hoping for. Maybe if they try a just little harder or work just a little more. God doesn't work that way. If there's one thing I want my kids to know for sure, it's that they can never do anything to earn God's grace, but that He gives it freely, and we should live lives of gratitude to Him. The concept of Santa definitely confuses this reality about God. *We can't know and have a personal relationship with Santa. God is all about relationship. He loves us and calls us to communicate with Him -- not just about our desires, but about everything. Our pains, our trials, our weaknesses. He calls for honesty and communication and union with Him all year round. Not just a wish list once a year. *Santa is fake. God is real. Eventually everyone finds this out. If the same parents who ask their children to trust them in everything -- and especially about the truths of God -- lie to their kids about Santa, doesn't that leave room for doubt about.....well, almost everything? We plan on doing special advent devotionals, just like we do mini-devotionals each night year round. We hope to do a Jesse tree that will remind us of God's great plan of redemption. And we plan to have lots and lots of conversations about Jesus' birth, life, death, and resurrection, and what it means for us. I hope this unintentional little manifesto of mine won't leave you feeling condemned if you do choose to do Santa, but I do hope it will help you to think about ways to intentionally focus Christmas on Jesus. Merry Christmas!